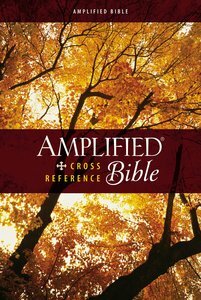 About "Amplified Cross-Reference Bible (Black Letter Edition)"
The Amplified Cross-Reference Bible offers the full text of the popular Amplified translation along with an extensive center-column cross-reference system to help you get the most out of your Bible-reading experience. The Amplified Bible is designed for readers who want to understand all the rich nuances of the original Bible languages. No working knowledge of Greek or Hebrew is required---just a desire to know more about what God says in his Word. With its unique system of brackets, parentheses, and italics, the Amplified Bible defines and expands key words and phrases right in the text. Verse by verse, the deeper meaning behind the message of Scripture unfolds as you read.